It’s always a delight to find a tough shrub that’s not only beautiful, but edible! Pineapple guava, also known as feijoa, is a just such a rare find. 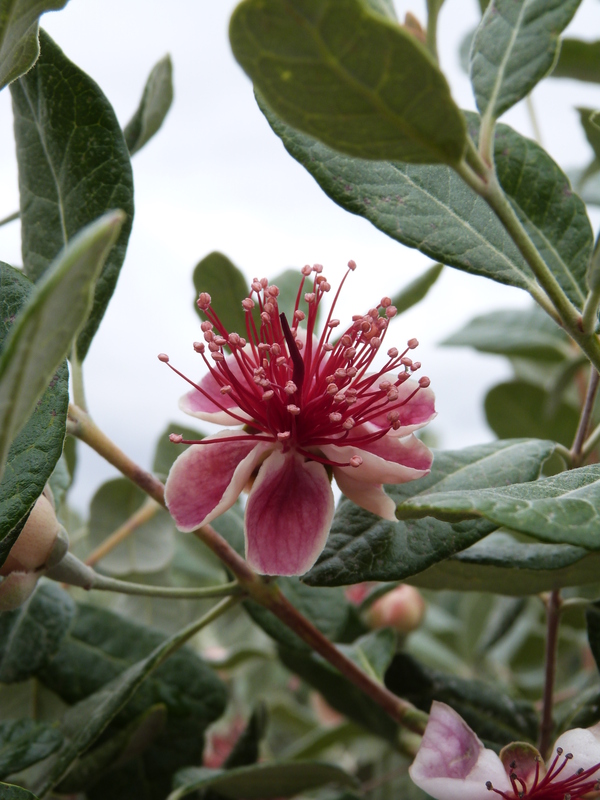 Pineapple guava is a versatile shrub and is not terribly picky about soil; it will tolerate many different soil types. While it’s best planted in full sun, plants can tolerate some afternoon shade. It’s best not to plant it in full shade, however, or you’ll lose the blooms! The evergreen foliage is oval in shape with silver undersides. The unusual color pattern provides foliage contrast in the landscape. In spring and early summer, plants burst into bloom with shiny pink and white flowers. The flowers are edible and have a sweet flavor. Several months after flowering, small pineapple-flavored fruits emerge. Fruit is small, only about 2-inches long and green in color. Once established, plants will need occasional supplemental water. Use pineapple guava has a hedgerow, foundation shrub or specimen plant in the landscape and containers. Selective pruning should be used to keep plants to size.